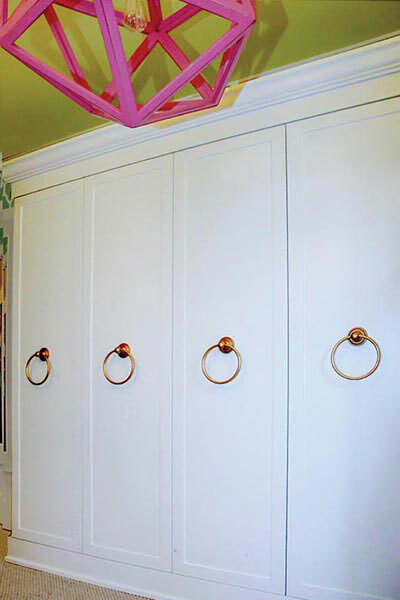 The white finish on all the Closet Works custom storage pieces compliments the bright walls and accent pieces in this beachy but feminine style space. Featured in the Lake Forest Showhouse and Gardens tour, this custom dressing room organization system offers plenty of storage for even the most devoted fashionista. Located in a historic manasion just steps from Lake Michigan, a previously tiny servants bedroom was converted to serve as dressing room and closet for the adjoining, larger, young lady's quarters. Designed by architect Edwin Hill Clark during an era when people owned fewer clothes, many older homes, even those built for the wealthy, lack what modern homeowners would judge as functional closet space for the existing bedrooms. Working with professional partner Kendelle Cornette who designed the room with a feminine, beachy aesthetic, Closet Works was called upon to lend expertise at creating storage space for the room that would look as though it was part of the original design, while also fulfilling current storage needs. 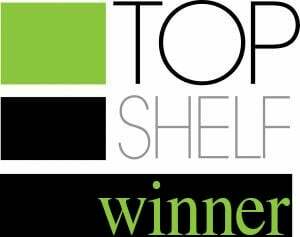 Because the room is more than just a closet, ample hanging and shelving space was incorporated as built in wardrobe closets with doors. 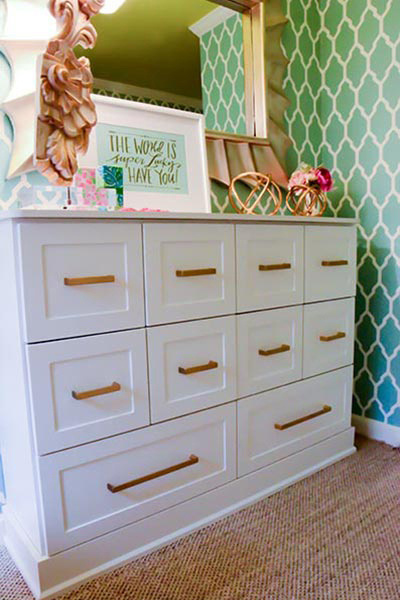 Pretty enough to be considered furniture, these built ins cover one wall and include floor to ceiling doors to maximize storage in all available square footage, making this dressing room a space that most young women would be happy to spend a lot of time in. With a nod towards modern innovation without marring the vintage aesthetic, a 360 Organizer® in the standard Shoe Spinner configuration was trimmed with crown and base moulding to blend with the age of the home. This rotating shoe closet system was implemented to hold a huge collection of footwear (holds between 85 and 200 pairs depending on shoe size). In addition to hanging space, shelving and shoe storage, closet drawers were definitely needed for lingerie, nightgowns, etcetera. However, the small, narrow size of the room was problematic. Ordinary furniture would have stuck out too far into the room. To solve this, a custom, built in drawer unit was designed to resemble a traditional dresser, but the size was configured with a shallow depth and greater height to maximize storage within the usable dimensions of the space. Built in closet drawer system with custom depth for dressing room. Wardrobe style floor to ceiling hanging and shelving space with doors for dressing room.